‘If it’s possible, I’d like to act live on stage at least once a year,” says film and television star Shun Oguri following an intensive rehearsal at a small studio in central Tokyo. At only 32, Tokyo-born Oguri is already a towering presence among a rising generation of actors, and he is about to see his wish come true as he prepares to costar in “Red,” a play for only two actors that premiered in London in 2009 before moving to Broadway and winning six Tony Awards the following year. Speaking to The Japan Times ahead of the play’s Aug. 21 Japan premiere at the New National Theatre’s 400-seat Pit stage in Tokyo, Oguri is eager to talk not only about the play but also about the debt he owes to senior actors who have helped him on his way — and his ideas for progressing the Japanese entertainment scene. Despite being by U.S. playwright, screenwriter and producer John Logan — whose credits include “Gladiator” (2000), “Star Trek: Nemesis” (2002) and “The Last Samurai” (2003), as well as the 2012 James Bond movie, “Skyfall,” and this year’s upcoming 24th 007 release, “Spectre” — “Red” forsakes action for art. That’s not to say the play is devoid of confrontation, as it brings together two painters from different generations — one, the famed Latvian-born American abstract expressionist Mark Rothko (1903-70), played by Tetsushi Tanaka, and the other his fictional young assistant named Ken (Oguri). However, while exploring the pair’s absorbing but often opposing views on the role and value of art, “Red” is also a kind of detective story as it delves into Rothko’s sudden, unexplained decision regarding a set of murals he’d been commissioned to paint in 1958 for the Seagram drinks company’s swanky Four Seasons Restaurant in its new Park Avenue headquarters in New York. But in the event, even the prospect of putting the rich and famous off their food wasn’t enough for the conflicted artist, who so disliked the restaurant’s atmosphere, and felt the place to be so entirely unsuitable for his works, that he returned his cash advance and refused to decorate the place in any way. In “Red,” Oguri’s Ken is a young artist, who, while enormously admiring his great master, also doubts Rothko’s old values from yesteryear. “Every day in the rehearsal room, I find new things in this play that I didn’t realize when I read it at home, and it’s fascinating to be exploring Rothko’s inner contradiction between his artistic beliefs and the reality of his business urge,” Oguri explains. “While it may appear Rothko is the darker part and Ken the lighter part of the same person, I don’t think it’s so simple — and I’m getting really excited about being on stage and telling this multilayered story to the audiences,” the actor says. During the rehearsals, Oguri says the discussion between him and fellow actor Tanaka, along with the director and translator, Eriko Ogawa, ranged far and wide as line-by-line they dissected Rothko’s and Ken’s relationship, considering it from the viewpoints of a father and son, and a master and pupil — and seeking to divine their inner motives at every turn. In fact, he says they once even invited Kikuko Iwai, a picture restorer who worked on one of Rothko’s paintings, to join them and share her insights into how he had addressed the canvas. For a young veteran actor like Oguri, though, such attention to detail is nothing new. Since starting his acting career at age 11, he has been continuously involved in TV dramas and movies, usually playing the roles of tall, handsome heroes. Then, at age 20 in 2003, he got his first main stage role in “The Fastest Clock in the Universe,” Englishman Philip Ridley’s violent play about hopeless youth. In that year, too, he played the noble young Prince Fortinbras in acclaimed director Yukio Ninagawa’s “Hamlet.” His brilliantly charismatic performance on that occasion led to roles in other Ninagawa productions of Shakespeare — including his 2006 staging of the bloody revenge drama “Titus Andronicus” at the Royal Shakespeare Theatre in the Bard’s hometown of Stratford-upon-Avon, where Oguri donned dark makeup as Aaron, an edgy, vicious Moor. Reflecting on that landmark in his acting life, the actor says, “It was a dream-like time. Many people openly talked to me when I was walking around Stratford and thanked me for my acting. The whole little town was full of theater lovers and theater there is deeply rooted in people’s lives. “Then, after the show, we went to a famous pub near the theater called The Dirty Duck, where we were welcomed by huge applause. There, some people asked me how I felt about Aaron and the play, so I tried to answer them in my poor English. Some bought me a pint, so I bought them a pint back. Then we’d shake hands and say good night. Yet high praise clearly hasn’t gone to Oguri’s head, as he is quick to attribute much of his success on stage to “great mentors” he has worked with. In “The Fastest Clock in the Universe,” for instance, he cites award-winning “chameleon” actor Kazuyuki Asano as having given him invaluable advice; while he says veteran Shakespeare actor Kotaro Yoshida, who played the title role in “Titus Andronicus,” openly and earnestly taught him how to recite the Bard of Avon’s lines. But first and foremost, Oguri says the turning point in his stage career came when he met Ninagawa. 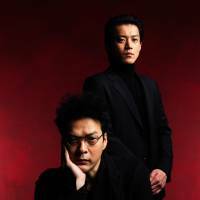 So, just as in “Red,” where the great Rothko passes on to Ken his wisdom about the essence of art, Japanese drama giants such as Ninagawa, Yoshida and Asano are now trusting Oguri to liven up the future of Japan’s theater scene. However, Oguri, too, has his own thoughts for the next generation. “I sometimes feel I am working in a unique and strange entertainment society in Japan,” he says. “In general, foreign actors are more independent than Japanese, and actors and geinōjin (celebrities) here are heavily protected by management agencies, so they easily forget about their own responsibility in society — myself included. 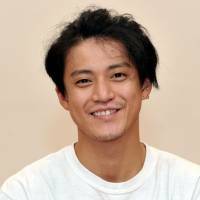 As busy as he is with his stage, TV and film work, though — as well as tending to family life with his actress wife, Yu Yamada, and their 1-year-old daughter — hopefully theater lovers will now be able to see Oguri on stage more often, not just once a year. And, of course, if all goes well, he’ll soon be back to Stratford-upon-Avon, where his English fans are doubtless eager to buy him more post-show pints at the earliest opportunity. “Red” runs from Aug. 21 to Oct. 4 at the New National Theatre, Tokyo in Shibuya-ku. The production will be performed in Japanese. For more information, call 03-5423-5906, or visit www.siscompany.com/red.